In order to express the connection between the sun and my family history, I have a 200 foot long scroll made by exposing Type-C photographic paper to sunlight. The pattern on the scroll corresponds to my breath. In a darkened room, I pulled the paper in front of a small aperture to expose it to the sun while inhaling, and paused when exhaling. I repeated this action until I breathed 108 times. One hundred eight is a number with ritual significance in Japanese Buddhism and culture. Infertile American Dream is a triptych of C-prints, which were created by exposing light-sensitive paper to sunlight on the day Trump was elected as the 45th US president. The increase of nuclear armament and the indication of using an A-bomb on a group Trump holds prejudice against, it harks back to the terror of my grandfather’s experience of Hiroshima in 1945. I had a haunting realization about my grandfather that he not only lost his physical home that he grew up in and his family that dwelled inside, but also any semblance of home. As I am a 3rd generation A-bomb victim who is now a resident of America, I found the chaos in the current political establishment unbearable. The political divides deepen and nuclear war seems closer on the horizon than ever before. Now, the dreamers who came to seek a home, hope, and safety in America are denied. If we continue to follow the path we are given now, the American Dream will be infertile and unable to sustain life; an empty and barren wasteland filled with nothing but ash left for future generations. They will not be able to have a chance to conceive their American Dream, just like the unassembled home in the photograph. It Made Angels Out of Everybody is a series of photogram that started off with responding to Willem de Kooning's quote “Today, Some people think that the light of the atom bomb will change the concept of painting once and for all. The eyes that actually saw the light melted out of sheer ecstasy, For one instant, everybody was the same color. It made angels out of everybody.” . In the high summer of 1945, a specially modified B-29 called Enola Gay dropped an atomic bomb named Little Boy onto the city of Hiroshima. My grandfather, only a fifteen-year-old boy at the time, was exposed to and witnessed the light that took away his family. Many years later, it took his life in the form of cancer. These prints were made by exposing a Type-C photographic paper to sunlight. 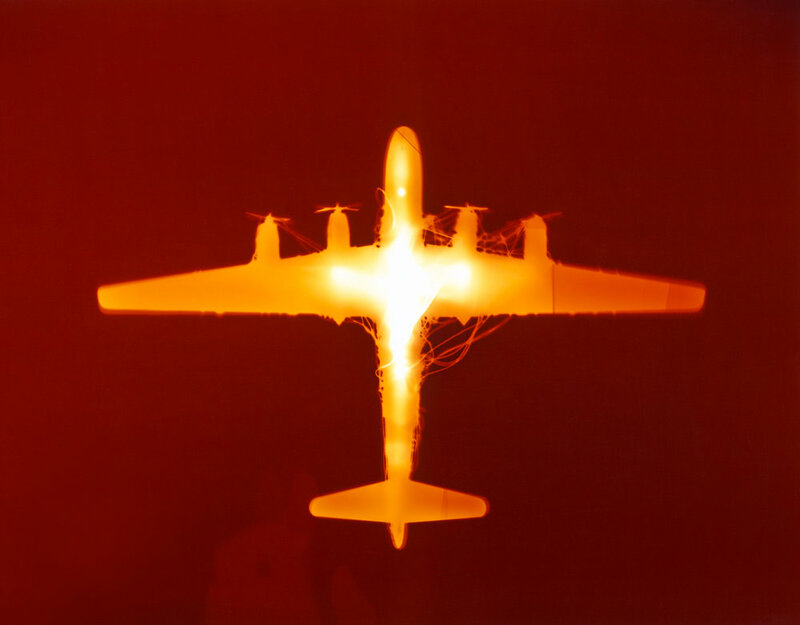 The inverted image of an airplane was formed with the shadow of a toy model of the Enola Gay onto the light sensitive paper. The airplane delivered the purest light which vaporized entire bodies of innocents, leaving only their shadows. The light cast by the innocent Little Boy on that fatal day created the darkest shadow known in history. The shadow grows and spreads as time continues, which allows little boys in their castles to obtain mountains of toys filled with atomic light. Should the future bear witness to this light, there will be none left to be called angels.